Our practice was originally established in the 1960s and moved to its present location in 1987. The practice was purpose built to provide dentistry in a relaxing and comfortable atmosphere. In order to maintain our high standards of clinical care and customer service the practice was fully refurbished and re-branded as Smile Essential in 2007. The team have worked exceptionally hard to ensure that our patients receive a world-class experience at every visit to our practice. A practice is only as good as its team, so we go to great lengths to keep ours fit. Smile Essential is committed in encouraging individual and team progression. We support our staff members to develop their existing knowledge by ensuring they all have a training programme to suit their needs, whilst we also invest heavily in post graduate training. As a direct consequence, the practice has earned several coveted awards. We are one of the first practices in Leicester to achieve Gold Membership of the British Dental Association Good Practice Scheme. In addition, in recognition of our commitment to the development of our staff, we have been re-accredited with the Investors In People Standard at Silver level. At Smile Essential we consider ourselves to be at the forefront of providing the very highest standards of cross infection control and we have made health and safety our highest priority. We follow HTM 01-05 guidelines on infection control to ensure that patients receive care in a safe and clean environment. We use the latest techniques to give as much protection to both our patients and ourselves as is possible. We are continually updating our knowledge through external courses and demonstrations of the latest breakthrough in technology. Many of the guidelines we are following are produced by the British Dental Association, and during our recent audit to become a member of the Good Practice Scheme we had our health and safety policies under close scrutiny, and were found to have the highest of standards. We use disposable items wherever possible. This includes bibs, dental instrument trays, needles, impression trays, cups, a variety of single use instruments and of course gloves. 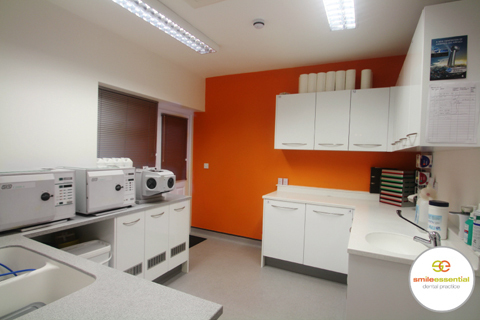 We have a dedicated decontamination suite ensuring that our high standards are maintained. We also make certain that all our equipment is regularly and properly maintained. All electric items, including autoclave and x-ray machines are screened and hold current safety certificates. The practice has an annual test of all fire extinguishers and carries out risk assessments as and when required. If at any time during your visits to us you have any concerns or questions regarding any health and safety, cross infection or general issues, please do not hesitate to ask any team members. Our systems ensure that we consistently meet high standards of dental care and clinical governance. We are registered with the Care Quality Commission (CQC). We have met all the CQC national standards of quality and safety. To view our inspection reports and checks, please refer to CQC inspection report. We also participate in Clinical audit, Peer Review, Clinical Governance and continuing postgraduate dental training. We all complete the statutory 50 hours of Dental Postgraduate training every year and travel far and wide to increase our knowledge on the latest techniques in dentistry. We are registered with the General Dental Council for continuing professional development. If any patient has cause for complaint, they may make a complaint in person, verbally by phone, in writing or by email. Please refer to our Complaints Procedures.